I am posting this to follow up with an earlier one to put up authentic reports from the Christians of Iraq and Syria. At our invasion of Iraq in 2003, Christians in Iraq numbered 8% of the Iraqi people, over 1.5 million souls. It is of course a disaster now as Daesh/ Islamic State seeks to destroy the entire past of the Middle East, the source of human civilization in ancient Mesopotamia, the land that was said to be the home of the Garden of Eden. This comes from the Chaldean Catholic Dominican Sisters, in an NCR story posted at http://www.aina.org/. AINA is an excellent source as to what is happening to all Assyrian/ Syriac Christians: Catholic, Syriac Orthodox, Church of the East, and the other communities (Latin, Maronite, Greek Orthodox, Armenian Catholic and Gregorian). The following account of the Dominican Sisters of St. Catherine of Siena-Iraq flight from ISIS is the result of multiple interviews of Dominican Srs. Maria Hanna, Superior, and Huda Chito, Principal, of the Al Bishara School (Annunciation School) for internally displaced Christians. The grade school is located in Ankawa, a suburb of Erbil, Iraqi Kurdistan. 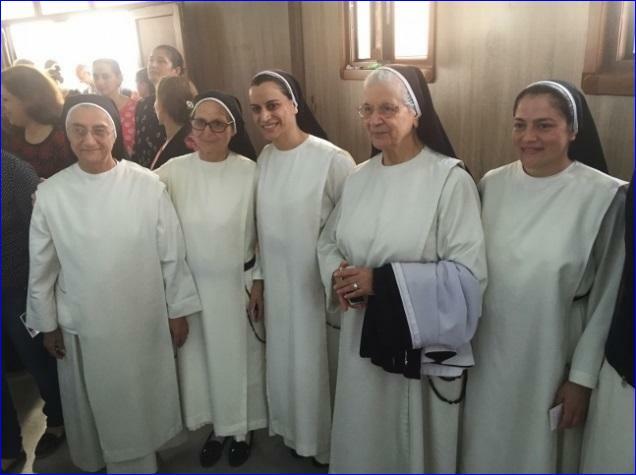 A CNEWA interpreter translated the interview of Sister Maria from Arabic.For almost 150 years the Dominican Sisters of St. Catherine of Siena-Iraq (Dominican Sisters) have served the Iraqi Christian community. They also strived to serve all Iraqis, including Muslims, as equals. The order’s charism is education, but by necessity their service to the community is broader, as they also care for the poor and the sick. The sisters are mostly located in northern Iraq, especially in Mosul and Qaraqosh, the largest Christian city in Iraq. The Dominican Sisters have a long and rich history of service and presence in Iraq, as further described on their website. NCR’s sister publication, Global Sisters Report, has published several articles about them, one of which can be found here. Parents of the children say, “Merry Christmas,” to the sisters on the holiday. Relations with Muslims were extremely good in the neighborhood. It was not a closed community, as if living in a ghetto. The sisters would open up to their neighbors, but when ISIS came to Mosul, they felt tension in relations with their neighbors. They didn’t know why. They didn’t understand what happened exactly but they started becoming afraid that maybe the Muslim neighbors were becoming fanatics and could pose a danger to them. At the motherhouse in Mosul — located in a difficult area of the city — the sisters maintained a cemetery behind the convent where the remains of 25 sisters were buried. It was not an officially approved cemetery, but one they had for many years. As concern about ISIS began to grow, the sisters decided to move the remains to their convent in Qaraqosh. However, they did not want to create any problems with the Muslim authorities in Mosul. They devised a plan they thought might work. In the early hours of the 2013 Ramadan feast day celebrating the end of 30 days of fasting when devout Muslims visit families and enjoy a large meal, including sweets, the sisters dug up the 25 graves and wrapped the remains — some consisted of just a few bones, while others were full skeletons — and placed them in a single pick-up truck covered with camouflage. They didn’t have means of transportation and they couldn’t just get a taxi so they went to the Chaldean church in Mosul, along with 30 other people, some of whom were lay people and some priests. There was only one bus available for 14 people, but they had to squeeze in 30 people in order to evacuate. They couldn’t get to Qaraqosh because the road was too dangerous so the only place they could go to was a village called Bashiqa, 20 minutes away from Mosul to the northeast. They left at 10:30 p.m., but because there was so many people traveling and checkpoints set up by ISIS that they had to avoid, they finally got to Bashiqa at 5 a.m. extremely tired and afraid. The Christian community in Qaraqosh and in the surrounding Christian villages were assured by the Peshmerga — the Kurdish fighters — that the Christian villages would be protected and that there was no way that ISIS would come and occupy the villages. The Kurds would be there to protect them. Peshmerga’s promise of protection was publicly-announced on radios and TVs. It was also conveyed in conversations with the bishops and the representative of the Kurds in that area. As a result, Christians considered themselves safe in Qaraqosh and in 14 different villages around Qaraqosh. Even though Erbil was only about thirty miles away from Qaraqosh, they didn’t arrive until 10 a.m. the next day. “When we finally met these sisters, they cried and we cried,” said Sister Huda. “It was both touching and sad,” said Sister Huda. “But by the grace of God, we can do so many things,” she said. The stress of the mass exodus from Qaraqosh to Ankawa had a terrible impact on the elderly sisters living in Ankawa. They began to suffer heart attacks and heart failures. Over the past 18 months, 23 elderly Dominican sisters have died, sometimes up to three deaths a week. “They died of a broken heart,” said Sister Huda. Awesome post. I had not heard this story. So many peoples and cultures had to run from ISIS. Thank you for sharing!